If there is one thing they know how to do super well in Los Angeles, it’s brunch. This town really comes into its own with the late morning meal and you can find every interpretation of this American classic here. Catch up with friends, top off that coffee, and tuck into some of LA’s finest brunch providers for an unforgettable brunch in Los Angeles. If you love your pancakes and French toast then head on down to Canele in Atwater Village. This friendly joint is well known far and wide for their gigantic hunks of French toast delectably soaked in custard for 24 hours! Recently voted the #1 Breakfast spot in Los Angeles by LAWeekly, this is sure to set your taste buds tingling. If there is one time it is acceptable to drink before noon, then it has to be brunch! The Belmont in West Hollywood is the place to head for 2-for-1 Mimosas and the chance to build your own Bloody Mary. A bit like an alcoholic infused salad bar, diners can choose from a range of fresh ingredients to produce the perfect Mary. 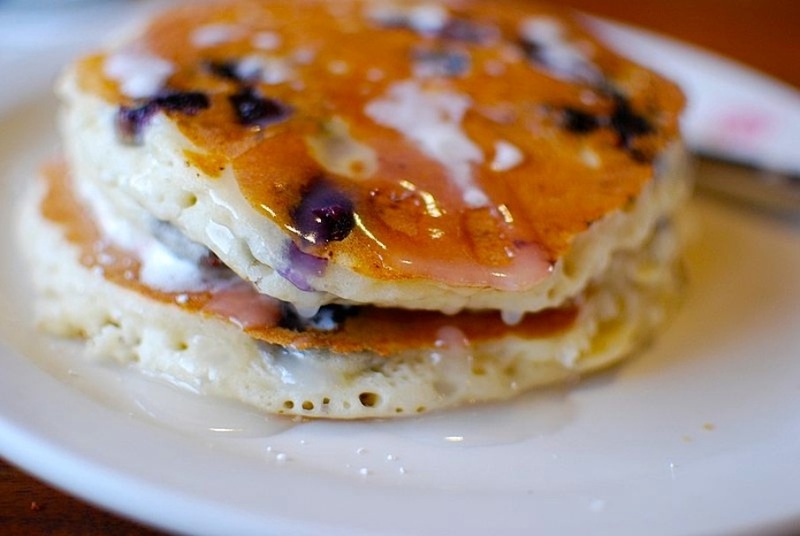 This is a favorite breakfast classic the world over and at the Blu Jam Cafe on Melrose, you can enjoy one of the best. Tuck your tastebuds into their perfectly poached eggs, hot crispy bacon and a generous helping of homemade hollandaise. Other great dishes here include crunchy French toast served with fresh fruit and a wonderfully spicy Tex Mex Tofu Hash for vegetarians and vegans. Like your breakfast a little bit spicy in the mornings? Then check out Oscar’s Cerveteca on Rose Avenue. Dishes range from their traditional and delicious Huevos Rancheros and Chilaquiles right through to more a creative fare, such as their Chorizo Burger. If Dr. Suess’ ‘Green Eggs and Ham’ was one of your favorite childhood books, then you are going to love the Huckleberry Cafe in Santa Monica. Their green eggs and ham dish includes la Quercia prosciutto, pesto and arugula and comes in a homemade English muffin. The brunch menu is extensive and includes organic and free-range produce where possible. Hugo’s in Studio City is the place to go if you fancy a totally scrumptious breakfast that’s kind to your health too. Breakfast is served up to 4pm daily, and you must try the wonderful green frittata. This super food breakfast is packed full of proteins and minerals to really get your day off to a great start. You’ll also find Eggs Benedict, Burrito De La Casa and the Chipotle Scramble all deliciously divine. Los Angeles is a great place for residents and visitors alike and has some of the best restaurants, bars, and hotels along with a high standard of living. If you are thinking of moving or relocating to LA then take a look at the Area Vibes website for the low down on median house prices, crime rates, amenities and other useful information for those looking to buy or rent. Do you know of a great place in Los Angeles to enjoy a spot of brunch? Tell us all about your favorite restaurant and best dish in the comments box below.